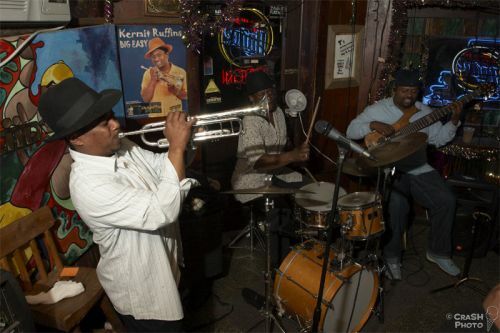 If you’ve never caught a Kermit Ruffins show, pack a bag, and head to New Orleans. 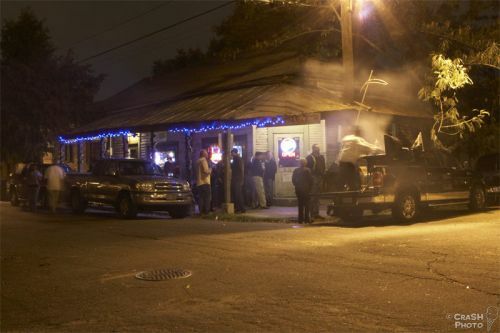 Preferably on a Thursday night when the man temporarily lays down his trumpet and wields his barbeque tongs outside of his weekly show at Vaughan’s bar in the Bywater neighborhood. Team Drunkard makes a point of it whenever we are in NOLA. Ice Cream Man photographer “Crash” Hattori managed to snap pics of both the jazzman’s talents, featured above, two weeks ago while in town for Voodoo Fest. Yeah, just look at ’em blow. These guys don’t ever hold back. I saw them a while ago and really enjoyed myself until I was escorted out…what can I say? I’m saucy. Check out my saucy link. honestly…find me another blog that features kermit ruffins and the burrito bros back to back? making jazzfest plans tonight. never been to vaughan’s (i’ve caught kermit @ the howling wolf) but need to add that to my list. New Year’s plans? considering the Porter Batiste & Stoltz / Dumpstaphunk double bill.